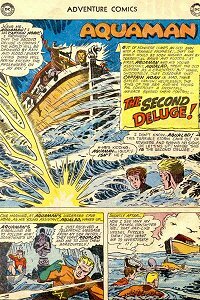 Adventure #271 (Apr 1960) - The Second Deluge! Captain Noah predicts a second great deluge and collects animals while violent storms happen in his vicinity. Glove Color: Green from here on out. Quotefile: Aquaman, "He's a kindly old soul! But he's off his rocker! When he sees he's wrong, I'm sure he'll put his ark in dry dock!" Finny Friends Report: Aquaman's sea patrol alerts the pair to a strange vessel. Aquaman has a school of whales form an airstrip for a plane having trouble in the storm. Octopi bail out a ship having trouble in a storm. Puffer ship hold up a ship that has a hole. Sawfish free another ship entangled in seaweed. Another ship is guided by pilot fish to the nearest port after fog closes in. Aquaman orders octopi onto Noah's ship. Drumfish alert Aquaman and Aqualad to looting in a storm hit resort town. Needlefish stitch the thieves' clothes together to immobilize them. Aquaman brings whales to push Captain Noah's ship into the three-mile limit so he can be arrested for causing the storms. The octopi were actually spies. Aquaman and Aqualad ride off on the octopi. A nice little tale with Captain Noah collecting all kinds of animals. I don't care how much gold he's managing to extract from sea water, the care and upkeep of those animals has to be really expensive. They've got lions, monkeys, giraffes, and a whole bunch of sea life that they shouldn't really need. While Noah claims that all life not on his ship will be destroyed, it's a freaking flood. What does Aquaman or his finny friends have to worry about? The last time we saw a full ark in Aquaman was in More Fun #87 (January 1943), when Aquaman himself gathered animals to show to the Atlanteans. Another similar theme was explored in Adventure #109 (October 1946), but that was sea life only.